I feel like all of our wedding posts have been leading up to this blog post, the post about our wedding ceremony! This was the true purpose of our wedding day - to get married and become husband and wife in the eyes of God and in front of our family and friends!! Most brides and grooms say that their wedding day was fleeting and went by in a blur. Knowing that, I was very intentional about soaking up each and every moment of our ceremony. I knew I wanted the words we exchanged to sink into my mind, and that I wanted to remember the feeling of marrying Zack for the rest of my life. While some of the exact words spoken have already started to leave my memory, those feelings of love, excitement, and comfort will remain with me for years to come! 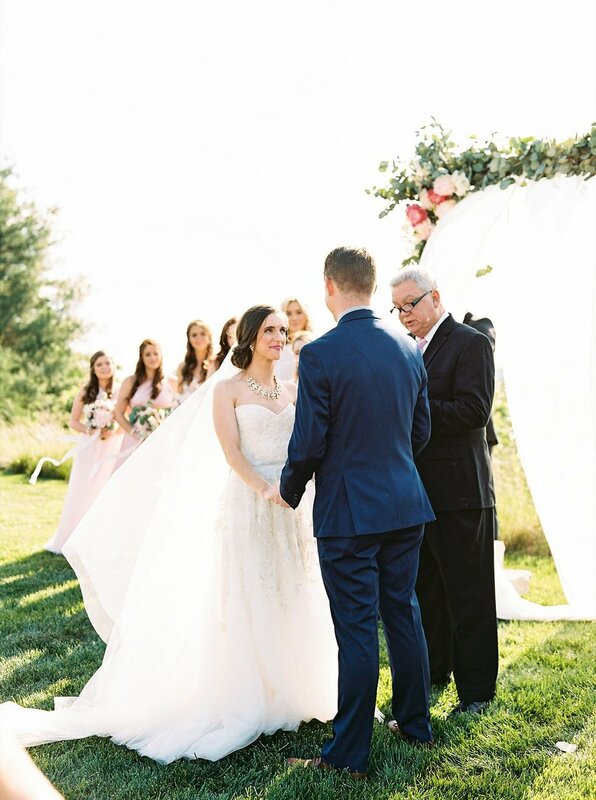 I absolutely adore the ceremony photos miss Perry Vaile captured of us, and our ceremony details in our wedding film by Casey and Kristin as well!! Make sure to read our feature and interview on the Southern Weddings blog for more details - I am sharing some more insight into our ceremony choices, readings, and songs in this post below as well! In lieu of traditional programs handed out to each guest, I wanted to create a statement piece that Zack and I could keep in our home for years to come. Most wedding program signs are made of wood, or are created on foam core boards. However, I wanted to try something new! Since I am an artist, I loved the idea of creating a wedding program sign on stretched canvas and displaying it on my artist easel. It was an extra nod to my personality that was subtle yet perfect for us! Our ceremony backdrop was one of my favorite details, as it was more intentional than upon first glance. The backdrop was made of three Adorn Company fabric panels, each with my parents' first dance song, Zack's parents' absolute favorite song, and our own first dance song in sweet sweeping navy brush calligraphy. The structure was then surrounded by the most beautiful blush and fuchsia peonies and my favorite greenery - silver dollar eucalyptus! Since we got married outside with the Tennessee mountains as a backdrop view, I knew I wanted to create a statement piece that was bold, yet also let the natural beauty of our venue shine. I absolutely love that when the sun shone through the fabric, you could see the outline of the mountains. But mostly, I loved that I was able to honor both sides of our families and the merging of our two families into one with this backdrop! PS - wondering why those two dapper gents are holding our backdrop? As I have mentioned in previous posts, it was SO windy on our wedding day! Our planners encouraged us to ask two family members (my brother and my cousin) to stand up with us during our ceremony and hold the backdrop structure to ensure it wouldn't fall on top of us as we were saying our vows! I'm really glad we went with that decision - especially since my brother got to stand by our side during our ceremony!! If we are being honest, Zack and I did not have specific songs set in mind for our wedding day for quite a while! What we did know we valued was finding a musician whose personality and style helped set the tone for our ceremony. Zack had worked with an amazing local musician, Logan Murrell, at a few weddings in the past. He let me listen to some of her songs, and I immediately fell in love with her angelic voice and comfortable style provided by her acoustic guitar. She was a perfect fit! Rather than searching for music on our own, we asked Logan if she could provide us with suggestions based on our musical taste and the environment we wanted to create. When it came time to choose the song I would walk down the aisle to, I told her I wanted it to be something soft, and completely unique to us and our love story. She recommended we use the instrumental version of one of her original songs, and we both loved that idea!! We then walked back up the aisle to her version of "Hey Ho" by The Lumineers, which was the perfect fun and cheery way to celebrate our marriage! I love these sweet photos of my dad giving me away! Our bridal party was all stationed downstairs to walk down the aisle, so the two of us had some time upstairs before walking down the grand staircase. My dad was so wonderful at providing the perfect words of comfort and love to me before this special time, and I am so appreciative of those few moments we had together alone before he gave me away! We had two readings from the Bible during our ceremony. My sweet uncle read Ecclesiastes 4:9-12. We love this reading, because it focuses on two coming together and helping one another throughout life and making each other stronger. That is how we always want to view our relationship! Zack's sweet cousin then read Colossians 3:14-20. We chose this reading because it reminds us to always let love, peace, and thankfulness be constants in our marriage. And most importantly, to let everything we do in our marriage be done in the name of the Lord! The biggest challenge we had to overcome while planning our wedding centered around religious beliefs and traditions. We had many conversations together, with our parents, a priest, Zack's uncle who is a pastor, and friends about how to stay true to ourselves and our religious beliefs while also keeping each of our family traditions active and be respectful of them during our wedding. It was definitely a big lesson in compromise and blending of families, and we are both so happy with the decision we made! I could not imagine having been married by anyone other than uncle LeGrand! Our sweet little niece Claire was completely carefree about our wedding ceremony, and was a tad bit more interested in Zack's mom's corsage than the fact that we were about to exchange our vows and rings, haha! I love this real-life candid photo of her!! Zack and I had talked about writing our own vows versus saying traditional vows, and we both quickly agreed on which option to choose! We chose to say traditional wedding vows, and are both so happy with that decision. 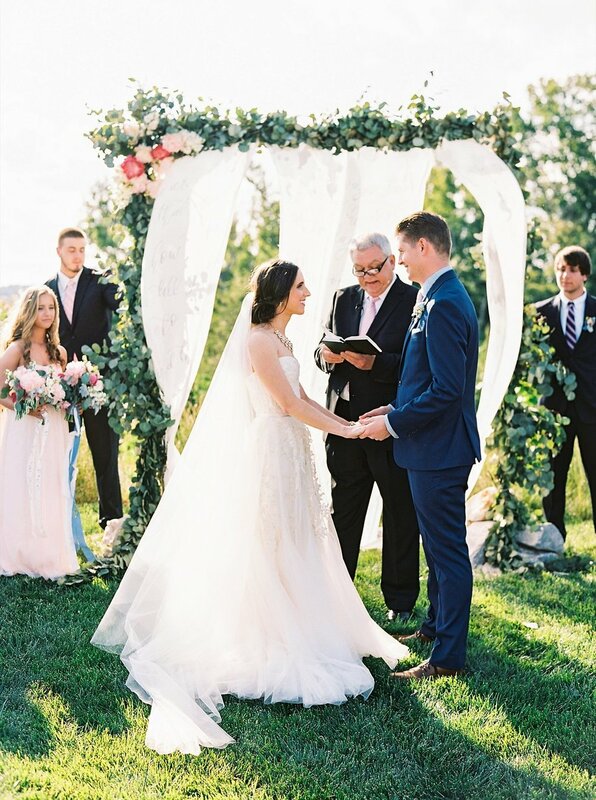 There is something so special about saying the same words and making the same promises to each other that our parents and grandparents vowed to one another years before! I also love how all of these photos show the range of emotion we felt during our ceremony, from love and adoration to pure joy and the perfect touch of silliness and laughter! Our ceremony would not have been truly "us" if it wasn't both serious and fun at the same time! Our first kiss as husband and wife was truly such a sweet celebration!! You can't tell from these photos, but I am fairly certain Zack was about to shout "let's go!!" before we walked back up the aisle, haha! It's one of his favorite phrases, normally said on game days or for anything he is really excited about! Make sure to watch our beautiful wedding film below for another peek into our wedding ceremony!